The Harvard Art Museums Archives is featuring an exhibit on WPA muralist and artist Elizabeth Tracy, later known as Tracy Montminy. Tracy, along with Arthur Willis Oakman, painted the four murals in the Cambridge Public Library’s historic reading room. The public is free to visit the exhibit this Thursday, October 25th from 12:00pm to 3:00pm, during the museum’s Archives Open Hours. “Religion,” on the east wall of the Delivery Room, featuring the City Seal of Cambridge, flanked by wreaths labeled General Works, Philosophy, Religion, Sociology and Philology. “Fine Arts,” on the west wall of the Delivery Room, with a historic clock at its center, flanked with banners titled Literature, History, Useful Arts, Fine Arts and Pure Science. “History of Books and Paper,” a series of three panels on the east end of the Reading Room, depicts the contributions of Babylon, ancient Egypt, China, Greece and Rome and medieval Europe. “The Development of the Printing Press,” on the west wall of the Delivery Room, is the largest of the set, and follows the evolution of the printing press from Guttenberg in 1449 through the invention of the cylindrical press by Hoe and Co. in 1820. At the center is the 1639 Stephen Daye press of Cambridge, the first press in America. The four murals were restored in 2009 when the Library was renovated. Tracy’s mural, Religion, during the 2009 restoration at the Cambridge Public Library. Tracy’s mural, The Development of the Printing Press, during the 2009 restoration at the Cambridge Public Library. 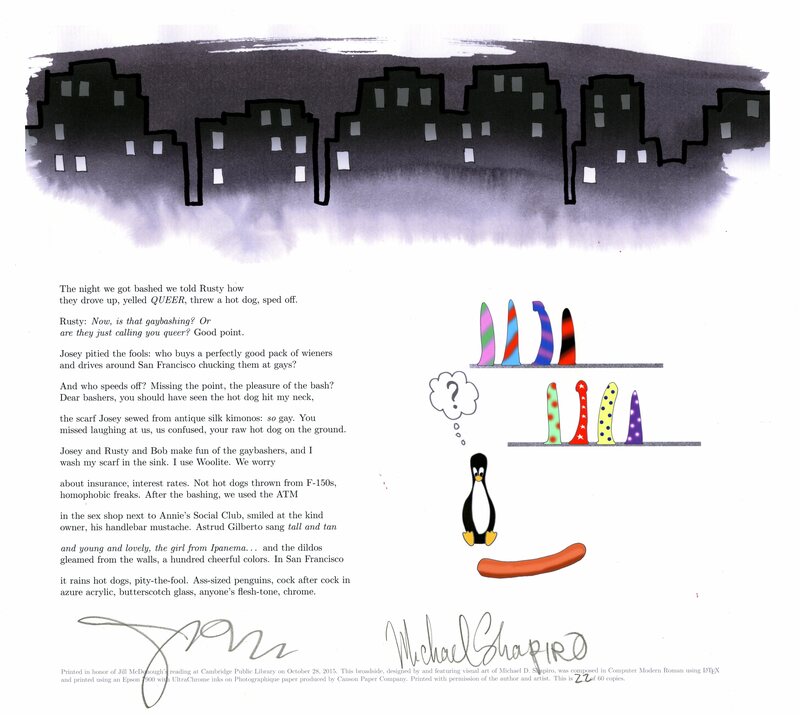 Broadside, Dear Gaybashers by Jill McDonough, illustrated by Michael Shapiro, from the Michael Shapiro Papers. A selection of broadsides, poems, and posters celebrating LGBTQ+ life are currently on display. Curated by Daniel Wuenschel, this exhibitions draws from the Cambridge Room’s collections and feature poets and artists connected to Cambridge. Available in the Louisa Solano Papers. Available in the Michael Shapiro Papers. Available in the Daniel Wuenschel Papers. Available in the William Corbet Papers. Celebrating 10 Years of Marriage Equality, designed by Luke Kirkland, 2014, Cambridge Public Library. Available in the Cambridge Public Library Records. 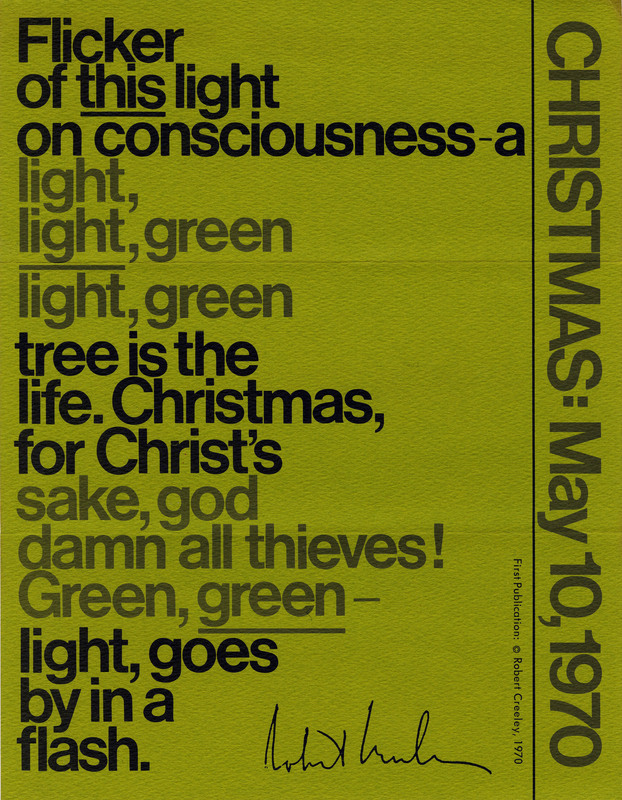 Broadside by Robert Creeley, 1970. There is a tradition among publishers and writers to send holiday and year-end greetings with meditations from their work relevant to the season. The exhibition features a small sampling of these types of greetings in broadside and chapbook format, from letter press workshops, poetry societies, poets, and artists. Two of these items were not intended as greetings, but nonetheless present content which is consistent with seasonal greetings of this tradition. They range in theme from the whimsical to nature, love, and more serious thoughts. **Special thank you to Dan Wuenschel, who curated the exhibition from his personal collection. Sumako (Ohashi) Cohn was born in Hokkaido, Japan. From 1968-1969, she studied oil painting at the Asagaya School of Art in Tokyo. Cohn moved to Boston in 1976, where she began to make watercolors of houses and local landmarks. 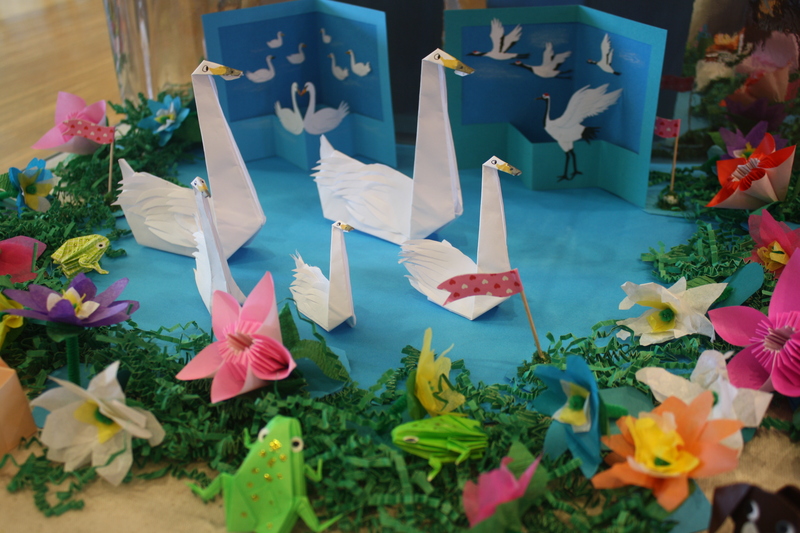 Cohn has taught workshops on Japanese ceramics, tea ceremonies, and zori, Japanese sandal weaving. Her artwork has focused on acrylic paintings, portraits, landscapes, still lifes, ink drawings, watercolors, paper doll collages, origami, and pop-out cards. She has exhibited her work in Massachusetts, Japan, and Hawaii. The Cambridge Public Library became “free and open to all” during the first great wave of American public libraries. Since then, the CPL has championed a free and open exchange of knowledge. 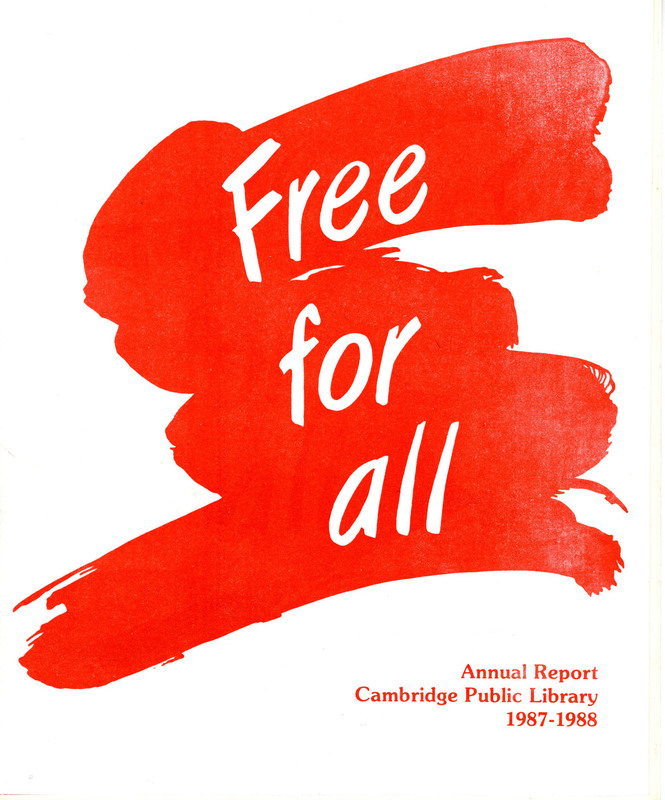 Cambridge’s first public librarians welcomed all visitors, answered questions, and made books and resources as accessible as possible, paving the way for the CPL to be known as the “People’s University.” This notion of free and open to all – radical at the time, but the norm today – has been the cornerstone of the CPL for over 155 years. In honor of National Library Week, the CPL wishes to remind everyone that the protection of privacy is a fundamental right of every library patron. Free access to information without bias, censorship, cost, or fear of repercussion is the very reason for which the library exists. 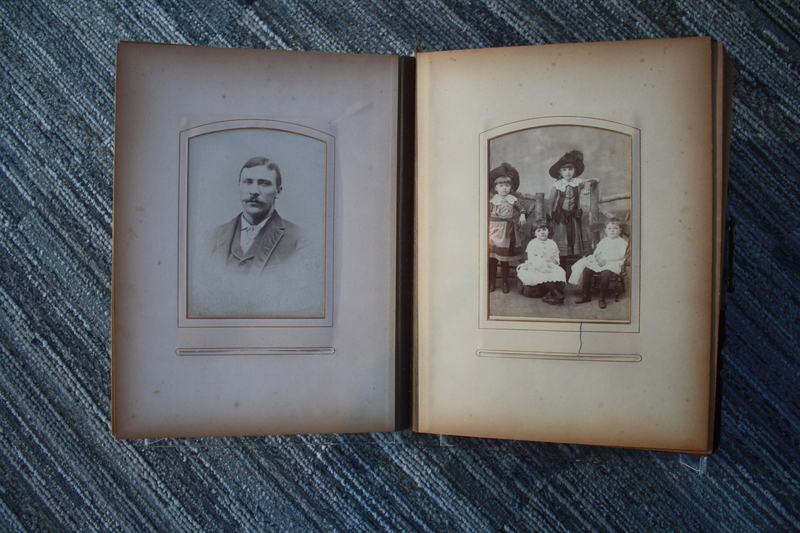 19th Century Family Photo Album, recovered during renovation, donated by Lionel Charles. This photo album, currently on display at the library, was discovered behind a wall during construction at a Prospect Street home. The 36 page album is filled with 47 formal portraits taken during the late 19th Century. With the commercial manufacturing of dry plate negatives in the 1870s and 1880s, photography – especially photo studios – became very popular in America. Although sitting for portraits was typically for the wealthy, if a family could save their hard earned money, they, too, would sit for a photographer, especially for milestones like marriages and births. This Prospect Street family photo album would have been treasured for generations. If you’ve found anything historic in your Cambridge home, the our archivist can help you determine what it is. Please contact the Cambridge Room for more information.